Laird Christianson Advertising Inc. won a Best of Show Pele Award in the broadcast category for its television commercial titled, "Trash Can" for the Board of Water Supply. HAWAII'S advertising industry illuminati gathered for the 27th annual Pele Awards ceremony last night at the Hilton Hawaiian Village Tapa Ballroom. This year, 56 Pele Awards for advertising and design were presented by the American Advertising Federation District 13. AAF District 13 member clubs include the Hawaii Advertising Federation and Ad 2 Honolulu, but not all winners are members of either organization. The importance of the wins can be determined and spun several different ways, but based on sheer numbers, Milici Valenti Ng Pack Advertising proved the night's biggest winner, with seven awards. 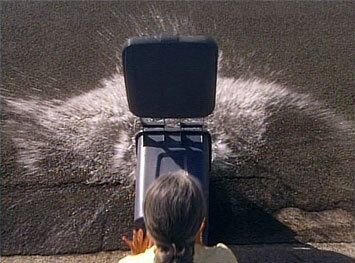 Its Pele-winning work was done for clients including Sheraton, Kyo-ya Restaurant, Aloha Airlines, Hawaiian Telcom, McDonald's Restaurants and Matson Navigation Co.
Laird Christianson Advertising Inc. won five awards, including a Best of Show nod for its television commercial titled, "Trash Can," for the Board of Water Supply. The agency's other clients include Wailea Marriott Resort, Mobi PCS, Easter Seals Hawaii and JW Marriott Ihilani Resort & Spa. Hendrix Miyasaki Shin Advertising Inc. also won five awards for television, radio and magazine advertising for AIG Hawaii as well as a special effects award for its work on behalf of the Hawaii Community Foundation. Matsumoto & Clapperton Advertising won three awards for its print ads for C.S. Wo and the Royal Hawaiian Shooting Club, winning an additional Best of Show designation for its "Girlie Men" poster for the latter. Jon Duarte Design Group claimed the Best of Show Pele Award in the design category for Centex Destination Properties' "Beach Villas at Ko Olina Campaign." Other agencies or designers winning three awards included VOICE, awarded, as it has been in the past, for its work for Hawaii Skin Diver Magazine; and Maui's Sae Design and Gilbert & Associates, each a Pele veteran. Double award-winners included FlashLight, Kinetic Film LLC, Jon Duarte Design Group, HMSA and Network Media. Jon Duarte Design Group's package design for Centex Destination Properties' "Beach Villas at Ko Olina Campaign" was designated Best of Show Design winner. "Look at the wide range of clients that won this year," said Barbara Scott, AAF District 13 chairwoman and executive producer of the awards show. "Usually when an agency wins a lot of awards like Milici, one piece wins three or four awards in different categories. That wasn't the case this year." The individual honors for advertising professionals presented at past Pele Awards shows was separated this year into its own daytime event. The 2006 Ad Leaders awards were presented in February. 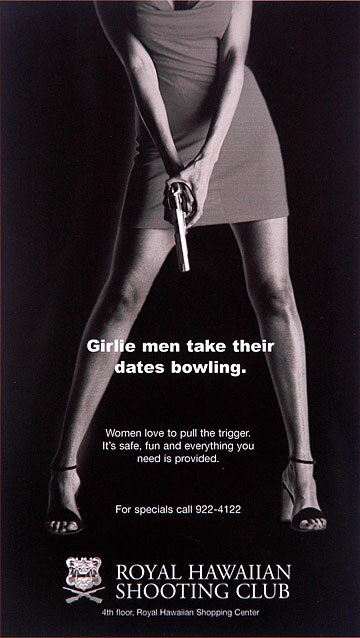 Matsumoto & Clapperton Advertising won a Best of Show Pele Award in the print category for its "Girlie Men" poster for the Royal Hawaiian Shooting Club. "Trash Can," Board of Water Supply, Laird Christianson Advertising Inc.
"Inspiration," Wailea Marriott Resort, Laird Christianson Advertising Inc.
"Use The Buddy System," Mobi PCS, Laird Christianson Advertising Inc.
"AIG Nails," AIG Hawaii, Hendrix Miyasaki Shin Advertising Inc.
"Mike," Easter Seals Hawaii, Laird Christianson Advertising Inc.
"Azul Invitation In-Room Pieces," JW Marriott Ihilani Resort & Spa at Ko Olina, Laird Christianson Advertising Inc.
"Hawaii 5-0 Winners Book '05," AIGA Honolulu, Hagadone Printing Co.
"Remote TV," AIG Hawaii, Hendrix Miyasaki Shin Advertising Inc.
"Present/Remote," AIG Hawaii, Hendrix Miyasaki Shin Advertising Inc.
"Bookstore," Hawaii Community Foundation, Hendrix Miyasaki Shin Advertising Inc.
"Gilligan's Island," AIG Hawaii, Hendrix Miyasaki Shin Advertising Inc.